Any application programming model includes a way to control the flow of processing. In an API proxy, that's done with flows. To flows you add logic, condition statements, error handling, and so on. You use flows to control what happens, and when. Flows are sequential stages along the API request processing path. When you add proxy logic, such as to verify an API key, you add the logic as a step in the sequence specified by a flow. When you define a condition to specify whether and when logic executes, you add the condition to a flow. The following flow configuration example defines a flow in which the VerifyAPIKey policy executes if the incoming request path ends with / and the request's HTTP verb is GET. You structure flows so that you can have logic execute in the right sequence along the processing path. Note: See Get Started with Apigee Edge tutorial for a simple tutorial on creating a flow. For specifics on configuring flows, see Configuring flows. When deciding where to add logic, you'll first choose whether to add it to a proxy endpoint or target endpoint. An API proxy divides its code between code that interacts with the proxy's client (proxy endpoint) and optional code that interacts with the proxy's backend target, if any (target endpoint). Useful when you need to make sure that certain code executes before anything else happens. If the PreFlow is in a target endpoint, it executes after the proxy endpoint's PostFlow. The place for conditional logic. Executes after the PreFlow and before the PostFlow. A good place to need to log data, send a notification that something happened while processing the request, and so on. Executes after conditional flows and PreFlow. If the PostFlow is in a proxy endpoint, and there's a target endpoint, the proxy endpoint PostFlow executes before the target endpoint PreFlow. 4 PostClientFlow (proxy flow only) A flow for logging messages after a response is returned to the client. A PreFlow is useful when you need to make sure that certain code executes before anything else happens. In a proxy endpoint, a PreFlow is a great place for code that authenticates a client and limits traffic from clients. In a target endpoint, where it begins preparing to send a request to a backend target, a PreFlow is good for first steps in preparing to send the request. For example, you usually don't want to service a client that has exceeded its quota. To support these requirements, you put security and quota policies in the PreFlow segment. That way, you don't need to worry about a condition failing to evaluate in a later conditional flow. The policies in this flow will always execute before any other processing takes place. In the following example, SpikeArrest and Quota policies execute before processing passes to conditional flows. Between a PreFlow and a PostFlow, you can have flows that execute conditionally. This gives you an opportunity to configure multiple sequences of logic, but have only one execute based on your proxy's state. A conditional flow is optional if you can execute all logic in PreFlow or PostFlow and no conditions are required (in other words, only one path through the endpoint is supported). Each flow specifies a condition that tests for different state values. This effectively branches execution based on conditions. For example, you might want to convert XML to JSON only when the requesting app is running on a mobile device. Note: In a conditional flow, the condition is evaluated in both the request and response. You cannot have separate conditions for request and response. Only one conditional flow is executed--the first flow whose condition evaluates to true. Here, quota constraints are enforced only if the request is a GET request with a URI pattern of /issue/** (/issue/ with anything in the URI after the last forward slash). You use flow variables to specify conditions. For more about using variables in conditions, see Flow variables and conditions. For examples of using pattern matching in conditions, see Pattern matching with conditionals. A PostFlow is a great place to perform actions after your endpoint's core logic, and before endpoint processing finishes. A PostFlow executes after conditional flows and PreFlow. A PostFlow is a good place to log some data, send a notification that something happened, transform the response message format, and so on. In the following example, an AssignMessage policy called SetResponseHeaders sets headers of the response message before Apigee Edge sends the response back to the client. A PostClientFlow can include only MessageLogging policies. If you include one, a PostClientFlow would be the last flow to execute, executing after a response is sent to the client. A PostClientFlow is good for final logging. Also, you can log the time interval between when the start and end timestamps for the response message. The client.send.start.time and client.send.end.time variable values aren't calculated until after the response is sent. Here's an example of a PostClientFlow with a message logging policy attached. Video: Check out this short video showing you how to create a PostClientFlow using the Message Logging policy from the Four Minute Video For Developers (4MV4D) series. When you add logic to your proxy, you do it by adding policies to your proxy's flows. Just as flows execute in a sequence (PreFlow then Flow then PostFlow, as described in this topic), the contents of a flow execute in a sequence. Note: For more about policies, including how to add them with the console and in code, see What's a policy? For details about attaching policies to flows, see Configuring flows. The following example flow configuration references three policies (configured elsewhere in their own XML files). The policy referenced by Verify-API-Key executes before the policy referenced by Remove-API-Key; both are followed by the policy represented by Quota. The Apigee Edge console present this sequence of policies as a row of icons, where each icon represents the policy. 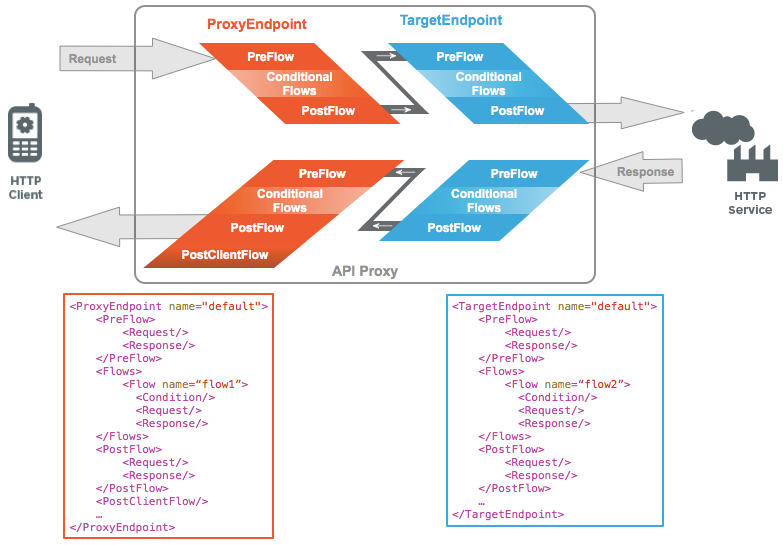 The Apigee Edge Trace tool provides a graphical way to see how the logic in your API proxy executes following a request. The tool illustrates processing between request and response. It doesn't specifically illustrate the separation between PreFlow, conditional flows, and PostFlow. For more about tracing proxies, see Using the Trace tool. You can raise faults from various places in an API proxy, including from flows. The following example is the response stanza from a PreFlow in a target endpoint -- in other words, it's the code that executes immediately upon receiving the response from a backend target. In the example, a fault is raised if the response from the target isn't 200 (success). For more about error handling, see Handling faults.